Growing up on the hard, sometimes unforgiving streets of Miami, Chiron has had to deal with a lot. He’s constantly heckled for being gay, even if, as a young kid, he doesn’t even know what gay means, or if he even is it. That’s why a local drug-dealer named Juan (Mahershala Ali) makes it his duty to take care of him and be something of a surrogate father to him. Chiron doesn’t know what to think of this guy, nor does he really know what a daddy is; his mother (Naomie Harris), is currently trying her best to raise Chiron, but her drug-habit is so persistent and reckless, that even Juan, the one who is selling the drugs to her, has something to say. Fast forward to Chiron being in high school and, well, not much has changed for him. He’s still getting picked on, he’s still finding himself on the bad end of brawls, and most of all, he still doesn’t know how to talk to people. The only person that he does have some sort of a connection with is Kevin, a kid who may be in the same boat as Chiron, but doesn’t quite know it yet. Then, fast forward many years later and all of a sudden, Chiron is out of Miami, making money as a drug-dealer, and yes, jacked as hell. But how did he get there? And better yet, what’s next to come? Baptize me in Miami beaches. It’s actually kind of weird to talk about Moonlight, but trying hard not to say too much about it. For one, it’s not necessarily a movie built on the element of its surprises, or its twists, or its turns that the plot takes, as much as it’s just about the story evolving into something that we don’t expect from the first scene. In it, we see a typical coming-of-ager where a young little tyke named Chiron, or as he likes to be named, “Little” (played by Alex Hibbert), all of a sudden is being raised and brought-up by a local drug-dealer. If this was its own little movie, it would probably get a 10 out of 10 from me. It’s sweet, heartfelt, honest, and perfectly acted by Mahershala Ali who, just saying, deserves something of an Oscar nomination (alongside Shia LaBeouf, but of course, neither of which will actually happen) for his work here, showing that the age old cliche of a drug-dealer with a heart of gold, really can be spun and seem fresh. But somehow, writer/director Barry Jenkins switches things up unexpectedly; the screen sudden fades to black and fast-forwards to a story that’s still about Chiron, but now, he’s older, in high school (played by Ashton Sanders), and somehow, it seems like a smart transition. For a director behind the camera and pen for a second time, it’s actually surprising how many risks and gambits Jenkins tries and yet, still somehow pulls it all off. It makes me wonder why his directorial debut, Medicine for Melancholy was so, meh. But that’s neither here, nor there. Anyway, what Jenkins works with best here in Moonlight is that he tells us an honest, raw, gritty and sometimes beautiful tale of love, finding one’s self, and becoming who you are, through certain periods of your life, but it’s neither sappy, nor sentimental. In a way, it’s a whole lot like Boyhood – not just in terms of its narrative – but in terms of how it depicts real, everyday things that people go through when they grow up, but never sensationalizing them; for someone like Chiron and all of us, they’re just things that happen and help make us who we are. Jenkins is a smart director, as well as a writer, in that every single scene, literally, every frame, there’s not just a certain feeling of inherent beauty lying from within, but we also feel that this is one singular story, and not just our own that we can relate to. And while, yeah, it’s great if you can relate to a movie, it’s not always a necessity and it’s why a movie like Moonlight, as much as it wants to be a typical coming-of-ager, is still uniquely original in its own kind of gritty way. Jenkins allows us to feel something for this protagonist, through all of the thick and thin, never judging him for who he is, what he does, what he becomes, and surely what he represents, but mostly just gives us a story of one person growing up, in Miami and encountering all sorts of painful hardships that gets so highlighted in so many movies, yet, so rarely feels as fresh and as organic as it does here. Stay there, kid. It’s not even worth it. That Jenkins doesn’t tell us exactly how old Chiron is through all of the stages of his life, or where certain characters are at when they’re not seen on-screen, doesn’t matter; the movie’s not about the plot intricacies and structure, it’s about its raw, painful emotions that, after awhile, are hard to resist. The movie doesn’t ask for you to cry, nor even shed a tear, but it’s hard not to. Its story is so simple and so easy-to-follow, that it’s almost criminal. How can so many movies with the same structure and same messages still get everything so wrong? Regardless, Moonlight may also be one of the rare movies in which its lead character is played to perfection by all of its different players. As a pre-teen, Alex Hibbert gets down perfectly the sheer innocence and sweetness that so many kids are born with and can’t ever shake off, regardless of how awful their surroundings get; as a teenager, Ashton Sanders is also quite great, showing a great deal of intensity and emotion, even without uttering a single word half of the time; and as a grown man who would literally have King Kong turning back for his island, Trevante Rhodes, an actual athlete who competed in the Olympics, is absolutely brilliant, not just displaying the same sense of raw intensity and emotion without saying anything like Sanders did, but going even further and showing us that there’s a small, vulnerable child still somehow trapped in there. It doesn’t get any better than these three and honestly, it makes me wonder where their careers are going to go next, what with all of the lovely attention this has been getting. But of course, there’s others in the cast and they’re all quite good, too. Janelle Monae shows up as Juan’s girlfriend/possible wife and fits perfectly into this movie’s world; Jharrel Jerome plays Kevin as a teen and does a great job showing a certain personality in a story that can get as bleak as Moonlight‘s; Andre Holland plays an older-version of Kevin and is quite perfect, showing a great deal of the same personality, but with an even better chemistry with Rhodes; and, well, unfortunately, Naomie Harris plays the drug-addicted mother of Chiron’s and she’s just not good. It’s a shame, too, because in all honesty, Harris is good in mostly everything else I see her in, but here, she was just so over-the-top and crazy, that she literally felt one crack-pipe away from Rosario Dawson’s similar character in Gimme Shelter. The movie tries to make her more than just the typical, cliche druggie-mommy, but in all honesty, she’s even worse as she really does carry the movie down with her. Hence why a 9 and not a 10. Sorry, fellas. 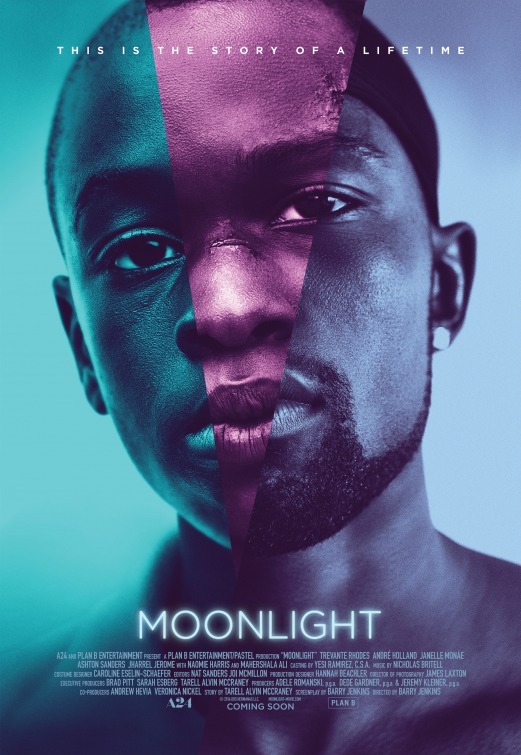 Consensus: Even with a plot as simple as this, Moonlight is still painstakingly raw and emotional, that it reaches for the sky, hits it, and then some, echoing in a new, exciting voice with Barry Jenkins. Nice review; cool to see another high score given all the positive buzz. Can’t wait to see it. “Painstakingly raw and emotional”. Your words say it all Dan. For me its a cinematic tapestry of lyrical moments and finely wrought detail on a journey for self-identity; you rarely see performances and filming like this.